I'm not even gonna lie, DriveShop got me all in my feelings. I miss this spicy little number, a lot. I'm not gonna waste too much time leading in to this review, so let's just get on with the goods. 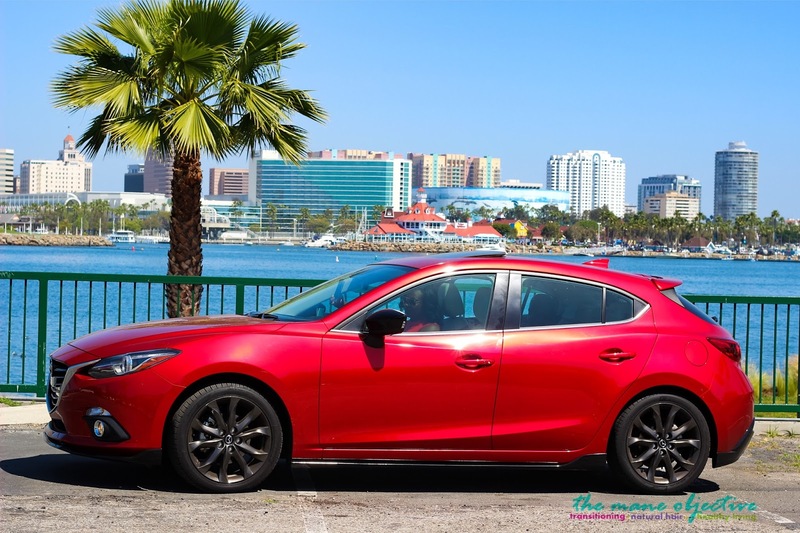 This time around, we're talking all about the 2016 Mazda Mazda3 S Grand Touring 5-Door or as I like to call it, my Car Spirit Animal. For the Mazda Mazda3 S Grand Touring 5-Door fancy pants top of the line version I rode around and got it in, the sticker price is $30,270. Click here to check out your local Mazda dealership! Have you ever felt like a car was your spirit animal? That pretty much sums up my experience with the Mazda3 S Grand Touring 5-Door. Like, I need you guys to understand this. In the week and some change that I had this car, I developed a severe emotional attachment. I was legit sad that I had to give it back. Before publishing this blog post, I strongly considered penning a plea to Drive Shop and Mazda to let me have, hold, and cherishthe Mazda3 S Grand Touring 5-Door forever and ever. Did you catch that? I love it. I miss it. I want it back. I want one for Christmas. Literally. See, the Kia Sorento was hella smooth. But hear me when I say Car Spirit Animal. 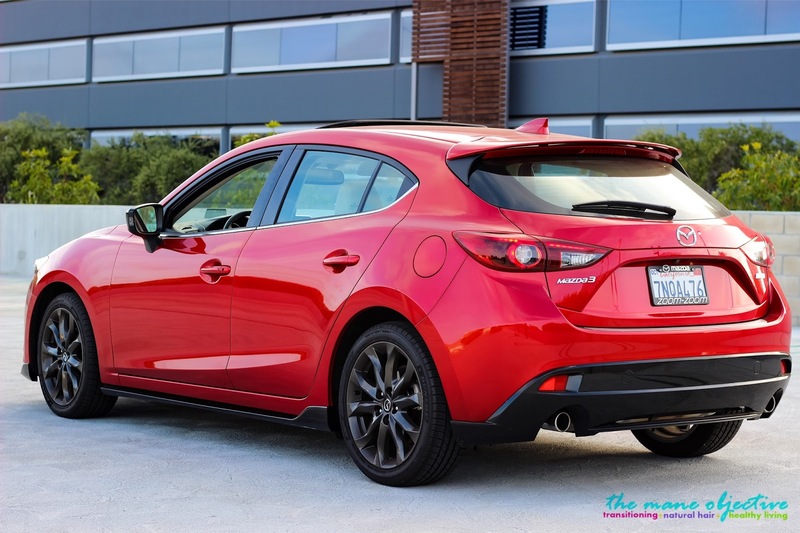 The Mazda3 S Grand Touring 5-Door was EVERYTHING. From the Soul Red paint and glossy black trim, to gunmetal wheels and sunroof, I'm hooked. Every time I pulled up somewhere - church, family gatherings or otherwise, everyone said one thing: "That car fits you". We go together, like chocolate chip cookie dough and spoons. Like ashy lips and eos lip balm. Like naturals and deep conditioner. The car just fit my lifestyle. I'm active, so having a sports-inspired car is right up my alley. I love bright colors, and I absolutely could not get enough of the Soul Red paint. I'm sans kids, so the size the the Mazda3 S Grand Touring 5-Door is perfect for rolling around the city with just me and the Mr. - or bringing the Nephs along. Honestly, the Mazda3 just gets me. Cool, but not too-too cool. Bright, but not gaudy. Tons of neat features without being over the top. And a sunroof...cause, melanin. 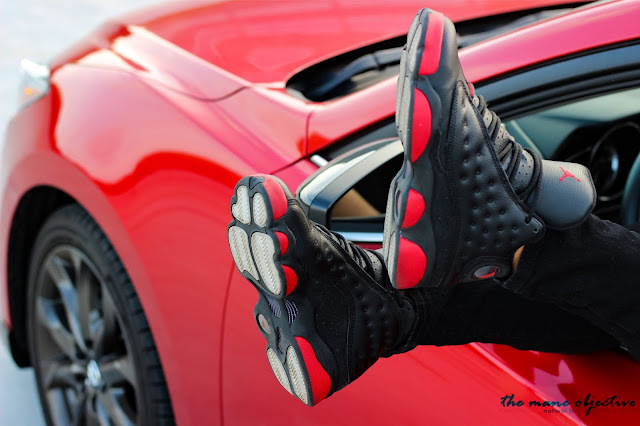 Plus, I mean, when you have kicks that match the car - it was meant to be, right? 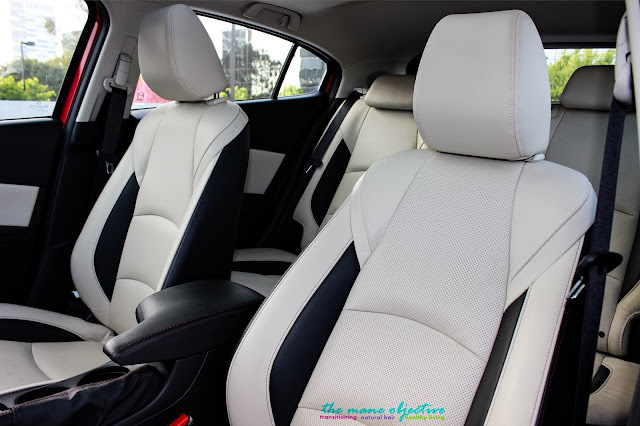 The worst part about the Mazda3 S Grand Touring 5-Door? It's not in my driveway right now with a big red bow and a "Just Cause You're Awesome" sticker. Other than that, I've got nothin'. If I was trifilin', I'd start a GoFundMe so y'all could donate toward my goals of a Mazda3 S Grand Touring 5-Door. But I'm not trifilin', I have a full time job, and a blog. Jesus didn't die on the cross to beg y'all for a selfish comeup, so I'll do what I need to do to put this baby in my garage by May 2017. If that means going out less, passing on sneaker releases, buying less hair products (gasp! ), and grinding harder to generate income under The Mane Objective banner, then so be it. But I mean, if Mazda wants to bless ya girl, who am I to say no? We would to help including around the car or truck simply just healthy the way of living. Now i am effective, and so which has a sports-inspired car or truck is usually suitable in place the alley. I adore shiny colorings, in addition to When i certainly could hardly receive plenty of on the Internal Reddish colored colour. Now i am sans young children, to ensure the measurement this this Mazda3 Ohydrates Lavish Traveling 5-Door is made for running about the location having simply just everyone along with the Mr. -- or maybe providing this Nephs combined. 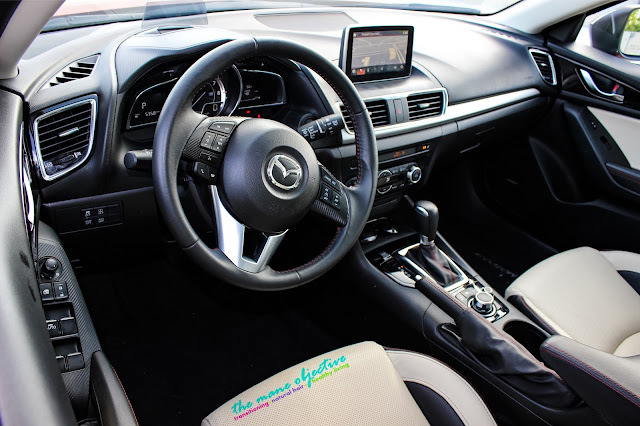 Genuinely, this Mazda3 simply just obtains everyone Likewise! Such a send is definitely practical and as well makes an incredibly good video about the make any difference in the head would be the first-time in addition to when i look into your blog. Hold on to uploading as i think gonna come to verify that each time! How can you write like a 12 year old and be old enough to drive?